Foam is made up of microfibrous cells that help penetrate and scrub out stains and marks from many surfaces. No chemicals needed - Requires only water to work - Use on walls, floors, baseboards, patio furniture, white boards, etc. 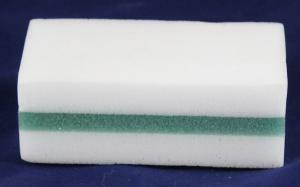 Unique sponge is composed of a layer of absorbent sponge in the center to hold water with two sides of melamine to scrub out stains. Sponge size: 4.8" x 2.65" x 1.5"